William Marvin Springtime in Rainbow o/c 30 x 40″ p.o.r. William Marvin is privileged to be able to capture the ever changing moods of nature, out in the open, fresh and unspoiled. These special moments have been saved by a man who has lived his whole life with one eye on the great outdoors. His childhood was spent in Omro a small town along the winding Fox River in Central Wisconsin. Living in a small town environment helped him develop strong Midwestern values and an appreciation for a lifestyle connected to the land. Like Tom Sawyer, he took every chance to explore the rivers, woods, and open fields of the surrounding countryside. The family moved to California and there he fell in love with the Western landscape on many backpacking trips throughout Oregon, Washington, and Yosemite National Park in California. Bill attended the Art Center College of Design in Pasadena taking extensive courses in design, drawing, painting, and advertising illustration. Upon graduating with honors in 1974, he came to Chicago to begin a challenging career as a graphic designer. Telling a story with strong shapes and rich color has been a consistent theme in his graphics and paintings. 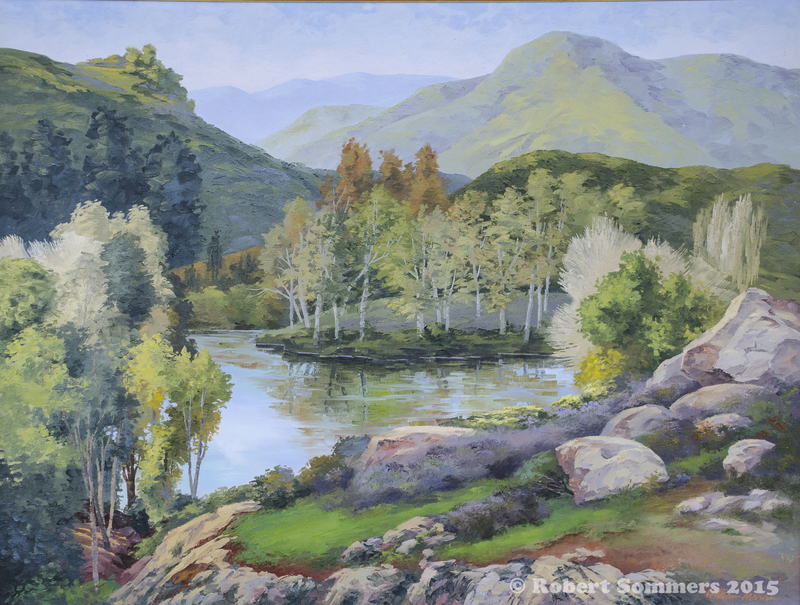 After a successful career that included illustrating children’s books, magazine publishing, and designing annual reports he returned to his first love, painting the outdoors. Bill started showing his landscapes in 1996 and immediately began to draw attention from collectors. Success in several Regional Invitationals helped develop the confidence to enter National competitions. In 1999 he was asked to become Vice President of Oil Painters of America and remained in that position for two years. He has painted extensively on the East coast, throughout the Midwest and Southwest, primarily in California. He has participated in several group and solo exhibits since the year 2000. Bill’s artwork hangs in private and corporate collections throughout the United States.